The Federal Government has released a report into the link between drought and climate change, which it says will trigger major review of drought policy. The report is by the Bureau of Meteorology and the CSIRO and is the first of three commissioned by the Government. 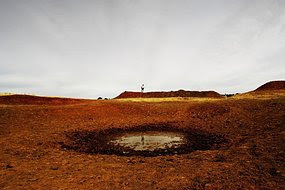 Prime Minister Kevin Rudd has said the report paints a very disturbing picture about the future of droughts in Australia. "Exceptional circumstances drought conditions ... will occur twice as often and with twice the area of droughted parts of Australia included. "Now this is a serious revision of the impact of climate change on drought." Agriculture Minister Tony Burke says it means drought assistance policy will have to be re-written. "If we fail to review drought policy, if we were to continue the neglect and pretend that the climate wasn't changing, we'd be leaving our farmers out to dry well and truly," he said.